Today’s post is about my most favorite summer side dish in the whole wide world. It’s a family tradition and it’s easy to make. In my family we call it tomato salad. In its most simple form in consists of tomatoes, onions, olive oil and balsamic vinegar with a touch of salt and pepper for good measure. In a fancier form, we sometimes add fresh mozzarella and basil. Nothing more. And it is delicious. It’s perfect for locallykatered because it uses readily available local ingredients that I usually have an abundance of it. You have to understand, my family originally hails from New Jersey and our last name ends in a vowel (though to be fair my siblings and I are not 100% Italian, we are a 50/50 mix of Italian and Irish). But still I’m pretty sure that being from New Jersey and that 50% Italian requires us by law to reserve 75% of any backyard garden for growing at least three different varieties of tomatoes – beefsteak, plum, and whatever wildcard variety your particular family desires, in our family, cherry. Also a law, there must be onions and garlic in the pantry at all times. It’s like a travesty if we don’t have onions and garlic. I don’t know how I’ve ever gotten anyone to kiss me as onions and garlic go into just about every meal I make. Every time we go grocery shopping Mike is like — really, more onions and garlic? Didn’t you make me stop on the way home for onions and garlic yesterday? Yes Mike I probably did – but I just want to make sure were covered. I think I have him trained well enough now that he just picks up garlic and onions even if they are not on the list I give him. There are lots of laws regarding foodstuffs in the Ricigliano household, i.e. at least five different varieties of mustard must be on hand at all time, ketchup must be bought in bulk, etc. For the purpose of this post we are going to talk about the oil and vinegar standards that must be up held. I am pretty sure that if you were to look in the kitchens of my parents, my sister, at least one of my brothers, and my own you would find about ten different varieties/flavors of oil and vinegar. The most oft used ones being olive oil and balsamic vinegar. So you can imagine my dismay when I first tried to cook for Mike at his place and found he only had canola oil and distilled white vinegar. The vinegar was only around for cleaning purposes. It was total culture shock. How do you not have at least three types of vinegar? Now that you have all that information about my family’s kitchen cabinet contents, let’s get to what this blog is really about-recipes with local ingredients. Thanks to my dad’s garden, my CSA from Bishop’s Orchard, my mom’s planted herb garden, and my upstairs neighbor’s (also Italian) garden I had quite the plethora of locally grown tomatoes, onions and basil. So tomato salad was on the menu at least four nights a week this summer. As an added bonus, and also what this blog is really about, I stumbled upon a new specialty food store opening up in my current hometown of Branford while sampling their wares at the Bishops wine fest. About a week or so later Mike and I were returning from another winery visit and we drove by the store. Actually we wouldn’t have driven by the store if it weren’t for the fact that all summer long Burger King was offering 50 cent soft serve cones, and vanilla soft-serve in the summertime is my Achilles heel, so I took full advantage of that offer whenever possible. I’m not ashamed to admit I double fisted it once or twice. But back to the specialty food store- What type of specialty food store was it you ask? Well it was an entire store dedicated to infused olive oils and balsamic vinegar! It’s called the Old Quarry Olive Oil Co., and let me tell you they have a huge selection. So Mike and I wandered into the store, as I had a coupon from the wine fest, and I was overwhelmed by how many different flavors of oil and vinegar there were for me to taste. I turned to mike and said this is going to take a while. And it did. The owner was wonderful and full of information. He was also very accommodating and patient as I tasted just about all of each infused olive oil and balsamic vinegar they had to offer. I settled on two of each, black cherry and blackberry ginger for the balsamic, and garlic and lemon for the olive oil. Now here is the thing about infused oils and vinegars, in my opinion the extra expense is not worth it if you are going to be cooking with them. Mostly because the high heat causes the flavor extracts to evaporate. They are however, wonderful for marinades and dressings and for my most favorite, dipping wonderfully crusty fresh bread. So seeing as I had pretty much busted the budget on fancy condiments that we really didn’t need I had to find ways to put them to good use to justify the expense. 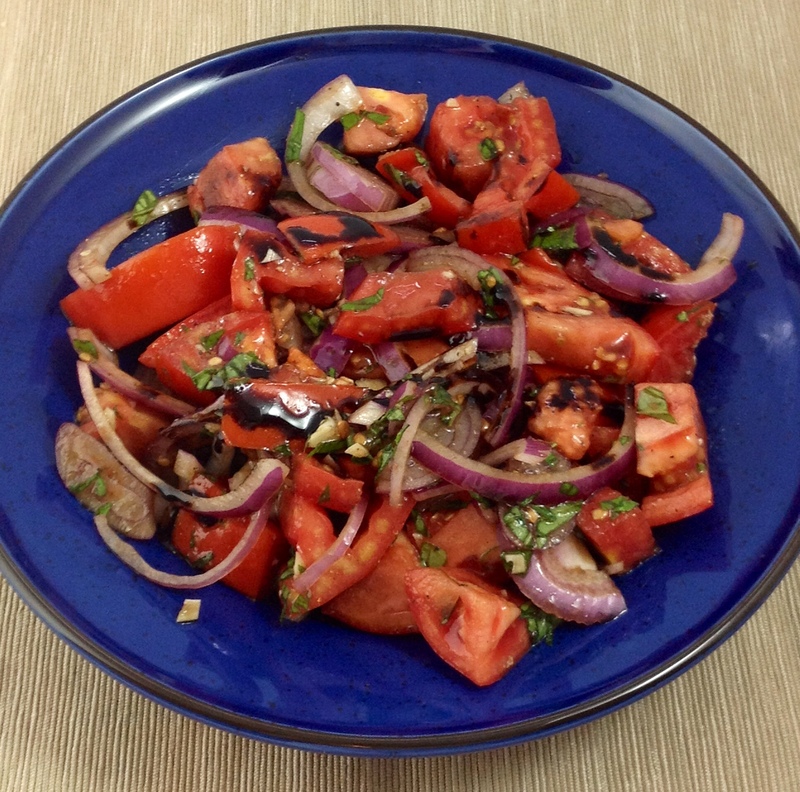 The first of which was the very simple tomato and onion salad. I dressed it with the black cherry balsamic vinegar and the garlic olive oil. I also added lots of fresh basil, minced garlic, a snip of fresh oregano, and salt and pepper to taste. The result was absolute Italian Garden deliciousness! I know that was a very lot of words for a very simple recipe, but come back tomorrow and I will give you a slightly more involved recipe including the blackberry ginger vinegar and lemon olive oil. 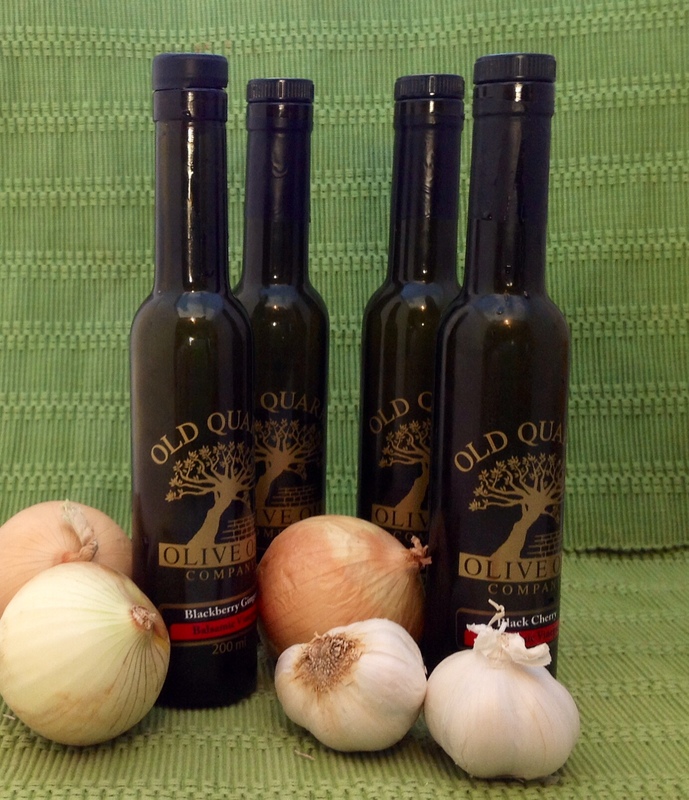 If you’re in the Branford area, I suggest stopping by the Old Quarry Olive Oil Co. and sampling until your heart’s content. Just be prepared ahead of time to spend some money. OK, so I know it’s been a long hiatus, but life just got in the way. It was a little overwhelming trying to start a blog at the same time that I was moving into a new apartment, and also planning a wedding, and in a horrible fog of another Lyme flair up, and you know all the other fun life events that get thrown in there. I sort of rushed things on the blog because it was summertime and I wanted to be sharing recipes and farm/winery visits in real time, but things just didn’t work out that way. It was hard enough to get the visits in and with all the other stuff that was going on. So the blog is going to be revamped a bit and mostly focus on recipes that use local ingredients, some that are currently available, some that were available at the time I made the recipes, and some that are available all year long. I’m still going to do the winery and farm reviews; in fact, I have a couple of partial drafts from visits I made this summer. They may be a little out of season, but hopefully they will give us all something to look forward to when the weather starts to turn and we all start wondering if Spring is actually going to come again. I’m also hoping to do some reviews of restaurants and bakeries, and maybe even some food carts. There are more and more finding ways to incorporate a little bit of local into their businesses. So really I am loosening up the definition of this blog to fit my life a little better. Plus, those winery visits were starting to get a little expensive as it is much easier to convince yourself that you can pay $13.00/lb for some fancy cheese after you’ve tasted about 12 different wines. Also- some things to look forward too, get excited for a feast of homegrown Thanksgiving recipes. It’s my family’s favorite holiday and I’m hoping to add a bunch of local touches! So stay tuned and hopefully there will be lots of good stuff to come! This post is more of a confession than anything else really. Because I’ve been feeling so damn anxious about not having time to post every day with some lovely new recipe from my CSA , or a review of the incredible vineyards I’ve been visiting over the weekends. And I have gone to some truly amazing farms and vineyards and met some really spectacular passionate people who love what they do and the products they are making. And I have a lot of stories to tell, that will eventually come out, just not as fast as I would like probably because life gets in the way. But I do want to thank all the people that have made my summer such an exploratory and flavorful experience. I kind of got overwhelmed with things and started to feel sad for myself that the tens of people who are reading my blog are not really giving the wonderful people and products I’ve been writing about the exposure they deserve. 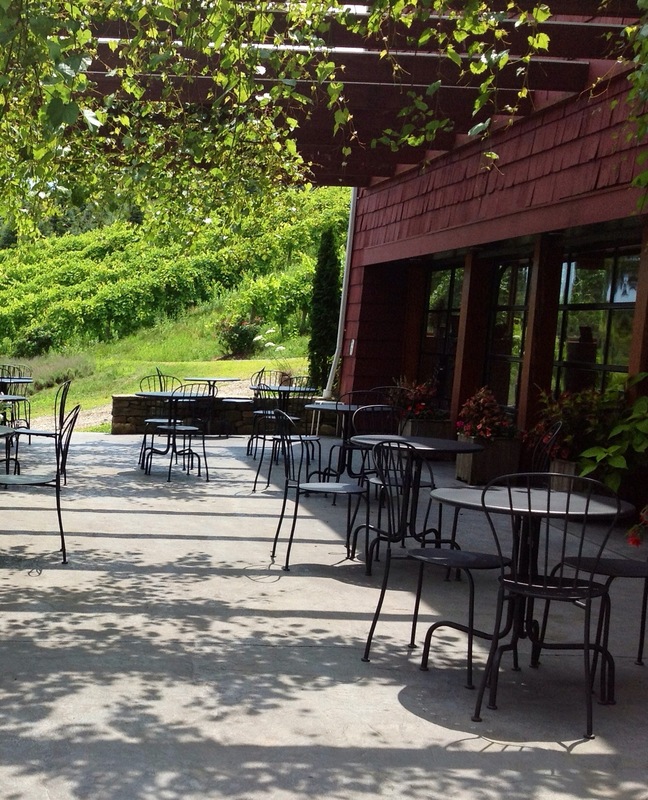 This week I am going to be doing a few posts about Bishop’s Orchard winery. And while I was thinking about how to describe the Bishop’s experience, it got me thinking about why I really like the Connecticut wine trail. The truth is, I don’t know much about wine. I’m really just starting to learn. To be perfectly honest, I don’t go on the tastings because I am really all that interested in the wine per say. It’s more about the experience for me. 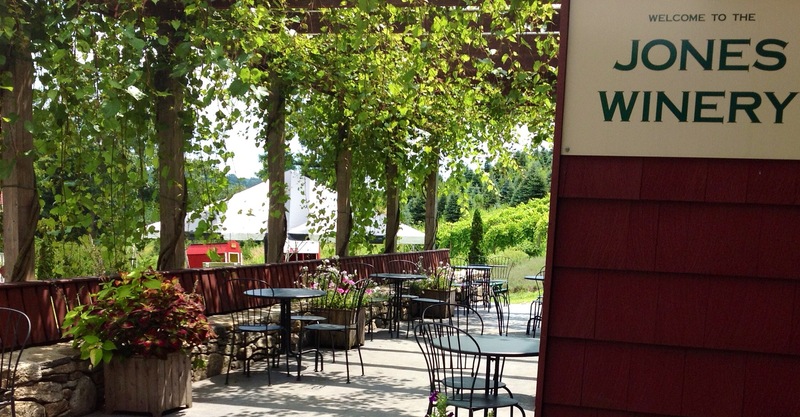 Visiting vineyards in Connecticut is a fun way to get the agro-tourism experience. You get to be outside, you get to see things growing, you get to try a little of this and a little of that. Usually the wineries will have a few other local products for sale from other farms, vineyards, dairies, etc., around the state. So you learn about this cheese from this dairy and this jam made with fruit from this other farm that spreads nicely on this fresh bread from this local bakery. And maybe you go and visit the sugar house that made the maple syrup that was next to the honey from a local apiary. All of a sudden there are a million places to visit a million local products to try and all this fresh produce to take home and experiment with. And you go nuts and decide to try and catalogue it all in blog. And then you go nuts again about not being able to keep up with it all! Jones Winery is unique in that it calls itself a family friendly winery. Considering it is connected to the Jones Family Farm, famous for their pick-your-own berries in the summer, Christmas trees in the winter, and Harvest kitchen, a farm to table cooking studio that offers classes throughout all the seasons, this makes sense. During my visit I talked to one of the tasting room hosts, David, who told me Jones family first and foremost is about educating people, about eating healthy from the land, and giving people the chance to have this unique experience that is dying in this country. He proudly pointed out the motto on the back of the Jones Farm employee shirt, “be good to the land and the land will be good to you”. To keep the farm family friendly, the tasting room and patio which are centrally located on the farm do not allow open bottles on the premises; they do sell their wines by the glass but limit each guest to two glasses per visit. They also do not allow outside food but sell local cheeses and other light fair. This is the kind of place you want visit for a family outing where the kids can go berry picking or enjoy many other fun things the farm has to offer. This is not the winery you want to visit if you plan on spending an afternoon picnicking and letting the wine flow freely. That being said, it is still quite a wonderful experience for anyone who enjoys fresh and delicious products. . The farm itself is beautiful. It is also kid friendly. While I was there a lot of parents with young kids came in to do tasting after having entertained the young ones with berry picking. Kids can often feel out of place at some of the wineries. Now that I’ve given you some idea what to expect on your visit it’s time to talk about the wines. Jones carries a mixture of fruit wines as well as the more traditional grape wine. David personally poured my tasting and was nice enough to answer all my questions. He explained that Jamie Jones, the 6th and most recent generation of Jones farmers to add something new and unique to the farm started planting grapes for the vineyard in 1999, though the first wines were not sold until 2004. Jones offers 11 or so wines, though I think that varies on availability. Most of the wines available are either 100% estate or Connecticut grown. I highlight a few that I liked, but check out their wine list for more details. I enjoyed their Pinto Gris which is entirely locally grown. Pinot Gris is usually my white wine of choice and this one is very pleasant, it was light and not too sweet. David mentioned the pinot was the farms signature grape, and that they had the most success with growing the pinot and the cabernet franc grapes. This brings us to another one of my favorites: the Rose of Cabernet Franc. I thought it would be a great summertime choice for red wine drinkers as it was more dry than sweet. A good dessert wine was the Raspberry Rhapsody, which they paired with a dark chocolate during the tasting. What intrigued me most about the wine was that David mentioned he uses it in his brownie recipe. While, I sadly forgot to pick up a bottle during my trip, I plan to purchase one on my next visit and incorporate it in a new baking experiment, possibly a flowerless chocolate cake, or rich chocolate mousse. Last but not least of my favs I experienced in the tasting is the Strawberry Serenade. It’s a sparkling wine, and what can I say, I love my bubbly! I’m trying to convince Mike that we need to buy a case of this for the champagne toast at our wedding. While it wasn’t available yet when I visited the tasting room, I did get to try one of Jones’ newest wines at the Shoreline Wine Festival (which I hope to recap later this month). The recently created a summer red called Beacon Light No. 8,is named for an historic light tower that was in a series which guided planes from New York to Boston in the 1930’s and was at one time located nearby the vineyard. Overall Mike and I had a lot of fun visiting Jones winery. Though I think next time I will plan ahead and see what else is going on. Their harvest kitchen hosts cooking classes and wine pairing dinners throughout the year, they hold a seasonal farmers Market on Friday’s and in the summer and fall some type of pick your own is usually going on. Check the website for more details on events.